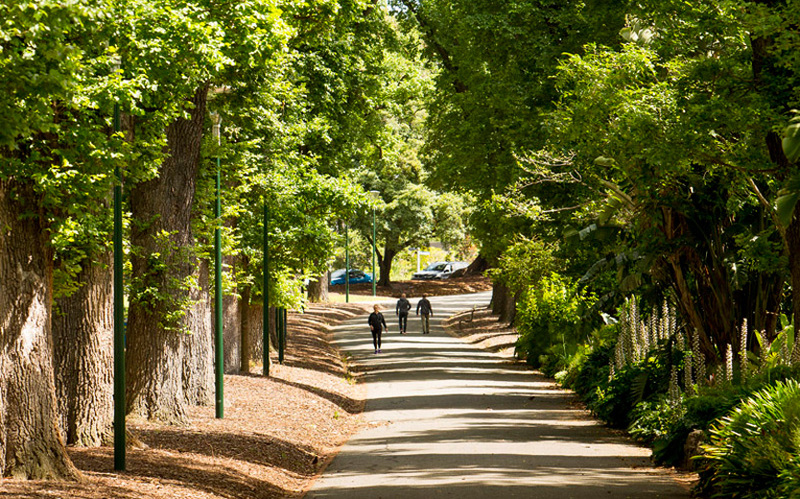 Welcome to the heritage-listed Fitzroy Gardens – one of Melbourne's most historic and beautiful gardens. 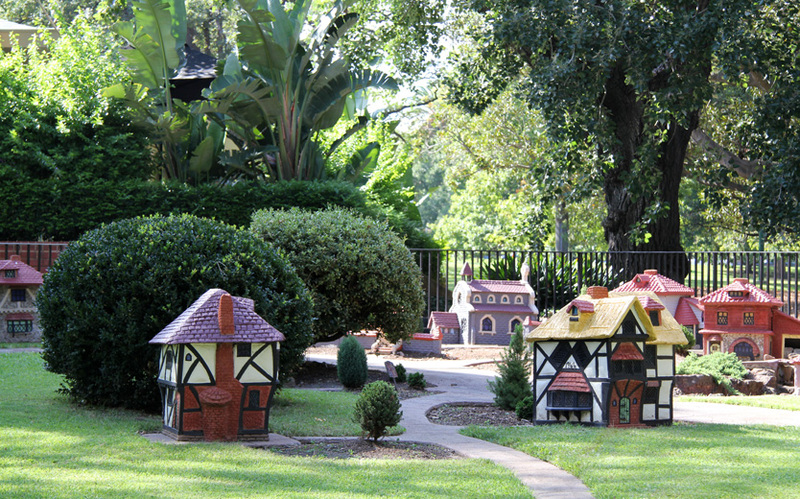 Set aside as a reserve in 1848, the gardens follow a classic Victorian-era design. Magnificent elms line the pathways, and the variety of flowers, ornamental shrubs and trees create a diverse and layered landscape. Fitzroy Gardens was listed on the Victorian Heritage Register in 1998. Discover the history of the gardens and the changes over the last century and a half, including the recent addition of this visitor centre. 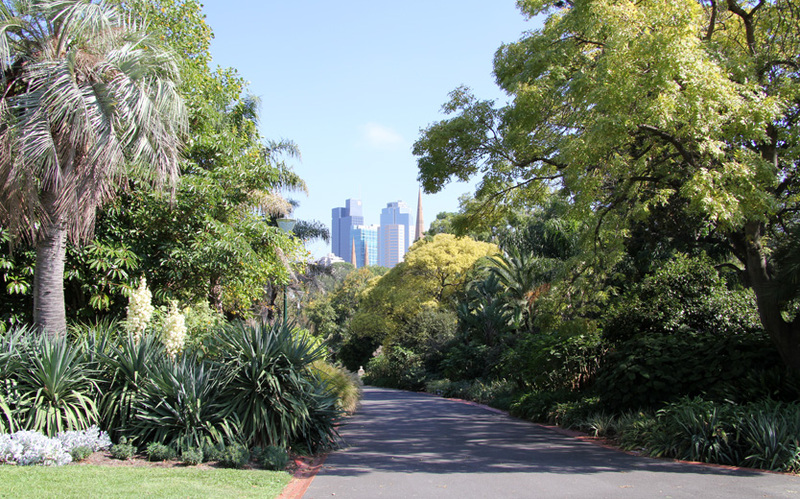 Discover the many points of interest in the Fitzroy Gardens with a free walking tour. Held every Saturday at 10am, tours start here at the Visitor Centre. No bookings required. Now a preserved tree stump, bark from this river red gum tree was removed by Aboriginal people to make something like a canoe, shield or container. 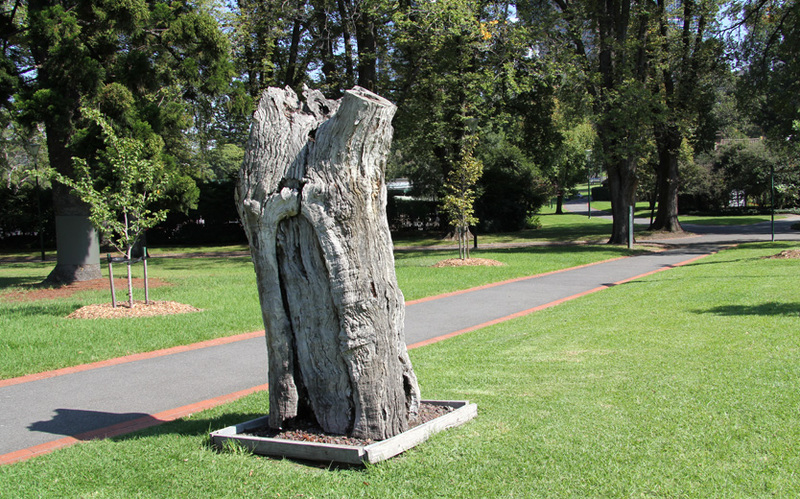 Similar scarred trees can be seen in Yarra Park, east of the Melbourne Cricket Ground (MCG). Cooks' Cottage, the oldest building in Australia. Owned by Captain James Cook's parents, the cottage was a gift from philanthropist Russell Grimwade to the people of Victoria. It was brought from Yorkshire to Melbourne to commemorate Victoria's centenary in 1934. The lovely Spanish Mission-style Conservatory, dating from 1930, houses magnificent floral displays throughout the year. The Conservatory is open from 9am to 5pm daily and entry is free. Please note that the Conservatory is closed when a changeover between displays is underway. NOTE: Due to unforeseen circumstances, the Conservatory in the Fitzroy Gardens is currently closed for emergency repairs. 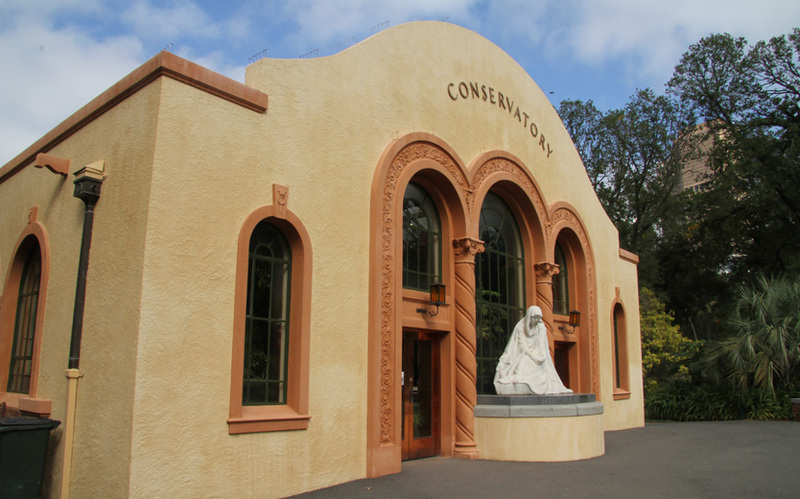 The Conservatory is not expected to reopen until late July 2019. Avenues of mature English elms line the major paths in the gardens. Commonly planted in Melbourne in the late 19th century, elms are now rare world-wide due to Dutch elm disease, which decimated populations in Europe and America in the 1970s. 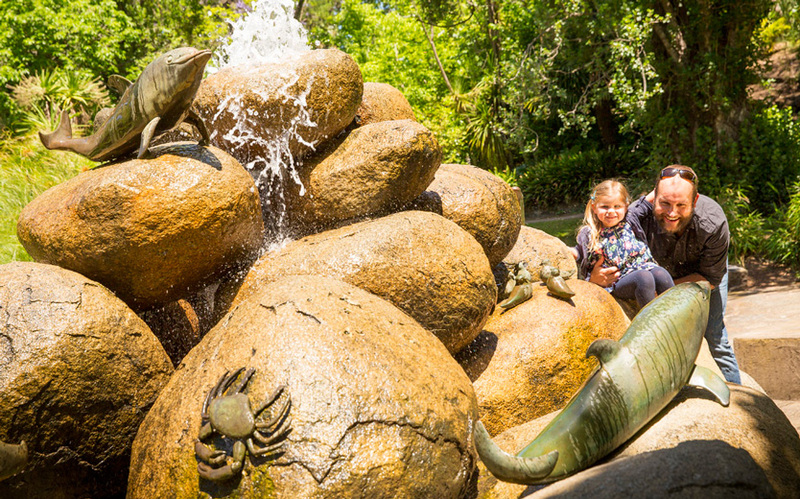 Beloved by generations of children, this river red gum stump features carvings of Australian animals, birds and bush spirits. 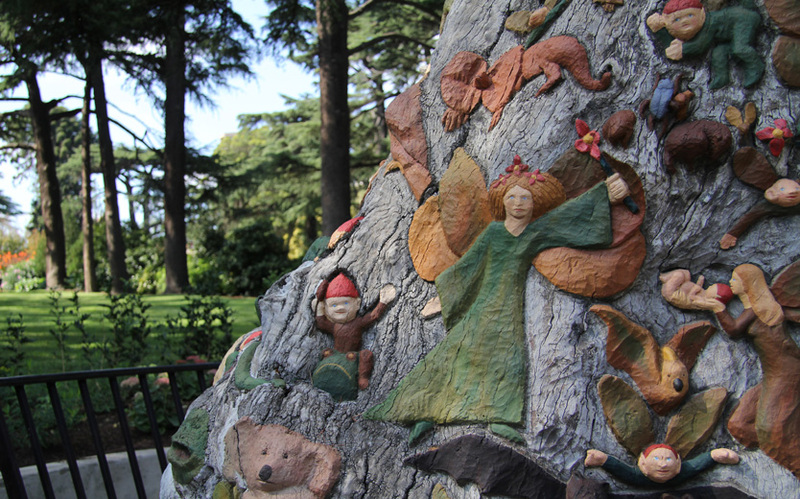 Sculpted by Ola Cohn from 1931 to 1934, the carvings were inspired by the Fairy Tree in Kensington Gardens, London.